TAKE A BOW - QUEEN'S HONORARY GRADUATES CLASS OF 2017! Over 6 days of summer graduation ceremonies Queen’s honoured 12 individuals who had given significant service in public or professional life, and who stand apart as ambassadors for the University and Northern Ireland both at home and around the world. 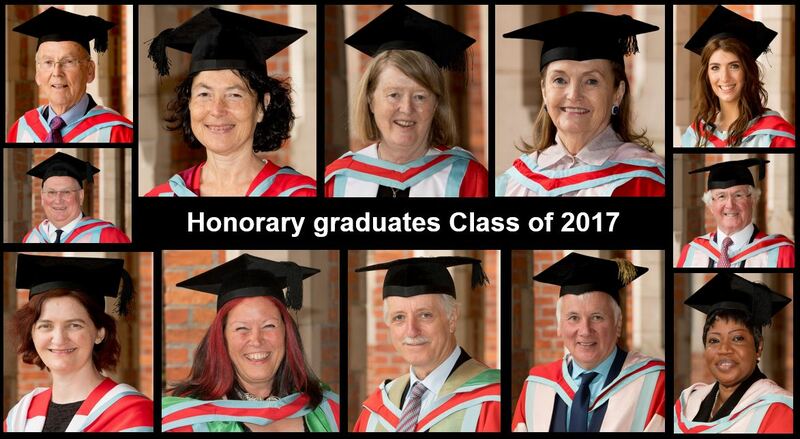 Earlier in the year the University announced the 15 people to receive honours (the remainder will be presented at winter graduation in December), including well-known local names from the world of sport, captains of business and industry, prominent academics, leading lights from the arts and public servants. Among those who received awards between 29 June – 6 July were Professor Mary Daly, President of The Royal Irish Academy (RIA), Professor Sir John Pethica FRS, Chief Scientific Adviser at the National Physical Laboratory and Professor of Material Science at Trinity College Dublin. Professor Lesley Yellowlees, Vice-Principal at the University of Edinburgh and the first female President of the Royal Society of Chemistry 2012–14 and Professor Sylvia Walby OBE, a Distinguished Professor of Sociology at Lancaster University and the first holder of the UNESCO Chair of Gender Research, were also among the recipients. Distinguished names from the fields of business and commerce including John Agnew CBE, Group Chairman of Henderson Wholesale, John Rainey MBE, Chairman and co-founder of the Denroy Group and Joe Sloan, co-founder of the SHS Group, received honorary doctorates for their services to business and commerce. Four-time Paralympic gold-medallist swimmer, Bethany Firth MBE, was acknowledged for distinction in sport. Bethany, from County Down has competed for Great Britain and Ireland since 2012, taking part in the London Paralympic Games, the Rio Paralympic Games (2016) and the Commonwealth Games. Sir Malcolm McKibbin, Head of the Northern Ireland Civil Service (NICS) and Permanent Secretary of the Office of the First Minister and deputy First Minister of Northern Ireland, received an honorary doctorate for distinction in public service. The Irish-American philanthropist, Loretta Brennan Glucksman, who was granted an Honorary Commander of the British Empire by Her Majesty Queen Elizabeth for her work toward peace in Northern Ireland, and the Irish-Canadian playwright, literary historian, novelist, and screenwriter, Emma Donoghue, were also among the recipients. Fatou Bensouda of The Gambia, the first female to hold the role of the Prosecutor with the International Criminal Court in The Hague, was honoured for distinction in public service and law. Being presented later in the year will be local boxer Carl Frampton MBE, who will receive a DUni for distinction in sport, Stephen J. Luczo Chairman and Chief Executive Officer of Seagate Technologies who will collect a DSc Econ for services to business and commerce and Professor Dame Nancy Rothwell FRS, President and Vice-Chancellor of the University of Manchester who gets a DMed for distinction in medicine. Media inquiries to the Communications Office at Queen’s University Belfast, telephone: +44 (0)28 9097 3091.